The average Monster Jam Anaheim tickets will cost you $77 for the event being held on 24/02/2019 at Angel Stadium, Anaheim, while minimum get in price is $14 on 24/02/2019. World's premier motorsport showcase, Monster Jam is coming to Anaheim for a series of shows at the Angel Stadium in Anaheim. Watch modified, giant-sized trucks as they are driven by talented drivers from around the world. Monster Jam is a motorsport showcase currently under the ownership of Feld Entertainment. It features monster trucks that are typically modified pickup truck vehicles with large wheels, insane horsepower and suspensions. The Monster Jam is an annual event that kicks off sometime during the spring time and tours across America, as well as Canada, Australia, Europe, Mexico and Philippines. It holds several qualifying events that determine the finalists for the World Finals event, usually held in Las Vegas. Monster Jam primarily features two types of competitions; freestyle and racing. Sometimes additional shows are added such as donut competitions, 'Young Guns Shootout' and the most recently addedWest and East Coast '#MoreMonsterJam Series.' The 2016 Monster Jam series will be hosting over 50 shows across America, with the inaugural show scheduled with the beginning of the New Year. Monstrous trucks that reign over 12-feet tall with horsepower as much as 1500 will be driven by daring drivers as they aim to qualify for the finals event. The upcoming show in Anaheim will feature a great lineup of driversthat include Dennis Anderson, Neil Elliot, Mark Schroeder, Rosalee Ramer, Frank Krmel, Churck Werner and Rick Swanson. Fans can look forward to watching monster trucks, Grave Digger, Felon, Metal Mulisha, El Toro Loco, Terminator, Max-D and Titan, up close. 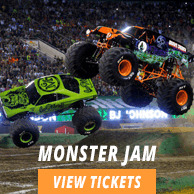 To attend, get Monster Jam Anaheim tickets now.